How many sheep on an acre? In this essay about the farms and farmers of Swaledale, I look at farm sizes, types, prices, wages, and work out what an acre actually looks like. Farmers are notoriously careful about disclosing their income, so without local knowledge it is difficult to assess their wealth except by acreage and staff. The censuses are of limited help here. But at Grinton’s Cogden Hall (250 acres) the landowning Whitelock family was farming before 1841 and continued to do so until after 1901. By 1861 the family had a cook, a housemaid and a nursery nurse as well as five farm labourers, a shepherd and a dairy maid. The farm passed from father to son, and in 1891 Aunt Sarah returned to live in the house where she was born, after a lifetime of avoiding the census-taker. Whether she was welcomed or not she was still there ten years later, with a paid companion. Actually, the 1851 census gives good clues about this family. In March 1851 Sarah Whitelock was not hiding from the census-taker but was visiting John Knowles’s wife Ruth and baby daughter at Hatters Roof, up the river at Low Row. Ruth Knowles had been born at Cogden Hall and was 5 years older than Sarah. And Grandma Whitelock was entertaining two grandchildren: Mathew Whitlock Knowles and Elizabeth Knowles at Cogden Hall. Could Ruth be Sarah’s sister? It seems likely. Nor do the censuses help when it comes to farm ownership. I had no idea how many farmers owned their farms, and how many rented. I had no idea how many had cash to spare, taught their daughters French and music, and regarded themselves as gentry, and how many were struggling to feed their families. I thought I might be able to work out from the census addresses how many farmers moved between one decade and the next. A year later I finally got there and the results are in my 1880s migration essay). A significant number of farmers also had other jobs, about 40% of them in fact, and over 50% in 1871. I have written about these part-time farmers separately (see Who did What?). I am intrigued to know what exactly these part-time farmers might have produced on their plots. Local soil and climate conditions would dictate output to a big extent, so I do not expect strawberry fields. But somebody was growing enough corn to occupy those millers up and down the river, and all researchers expect to find a pig, some hens, and a row of turnips in every back yard. Alan Mills, in his book Mining and Miners in 19thC Swaledale and Arkengarthdale speculates that three acres would provide enough bacon, butter, cheese and milk for a family of 8 and maybe half their potatoes. (Did anyone keep goats?) Early in the 19thC, William Cobbett wrote clear instructions for raising pigs but despised potatoes; Valerie Porter's Life behind the cottage door (Whittet Books, 1992,) describes more than you might want to know about pig-killing and root crops and fleas and flies and privies and bugs, and how cottages were built, and is a very entertaining and informative read for anyone interested in rural 19thC life. But smallholding output is not available in the census, so I must (reluctantly) shelve the question for now. I took this photograph from the centre of Reeth, looking north-east towards Fremington Edge. You can see how quickly the available land turns inhospitable. From the number of dairy-maids and shepherds in the censuses, it seems that many of the big farmers were dairy farmers or sheep farmers. Others must have grown cereal crops to supply the local millers, or kept beef herds. One of the biggest farms in the dale was owned by a butcher, which can't be a coincidence. I shall now step outside my self-imposed boundary of census-data-only because the Post Office directories of the 19thC give a clue. In 1879, the directory said: of Marrick: "The soil is light; subsoil, stone and gravel. The chief crops are grass, wood and moor land, with some wheat ..."; of Grinton: "The soil is light subsoil, stone and gravel. The chief crops are grass ..."; of Melbecks: "The land is chiefly moorland with grass. Soil light subsoil, gravel and stone ..."; of Muker: "The soil is light; subsoil, stone and gravel. The only crops are grass ..." and of Reeth: "The soil is various; subsoil, stone, gravel and mineral. The land is principally in pasture, with some wood and moorland." So the only cereal crops grown then were grown in Marrick. And sheep and cattle prevailed. They do today, as you can see from our photograph. "Good men obtained from £18 to £24, Strong youths £14 to £18, Lads £10 to £14, Female servants for farm work £12 to £16; Young girls £6 to £10". So the average male farm worker's annual wage was £16, which is about 6s 3d (31p) each week (how frequently were they paid? I don't know). I also found a newspaper report of an enterprising lad who sold himself twice at the annual hiring fair at Stockton in November 1874. His first employer, a Whitton farmer, who had signed the lad on for an annual wage of £16 10s (about 32p per week) went indignantly to his parents when he did not turn up for work. The farmer did admit that the lad had returned his hiring penny, and had not signed any contract, but he was still put out. The parents said he had later found a better position paying £18 pa but the magistrates said "it was not fair to farmers that lads should be allowed to go and hire themselves a second time because another party offers them a shilling more" and made an order that the lad had to go into the first farmer's service and pay £2 compensation and costs. I had earlier wondered at the comment "Indoors" added to many farm servants on census returns. I then found the explanation that this did not mean an indoor servant such as a parlour maid or footman, rather a farm servant who ate and lived with the farmer's family and so was provided with food and accommodation as well as a wage. So an outdoor farm servant presumably lived off the premises and came in to help, although I have rarely noticed such a description in the censuses. Livestock and produce prices were regularly printed in the local newspapers. The following transcripts, mostly from the Northern Echo, give a flavour. "The farmers and cattle dealers of Swaledale, Wensleydale and North Yorkshire mustered in strong force at this mart [Richmond Auction Stock Mart] on Saturday, when Mr George Harker disposed of a large quantity of cattle and sheep, at the following prices:- Gold cows, £15 10s; year-and-half old bullocks and heifers, £6 to £10 15s; two year old heifers, £9 to £13 15s; Irish heifers (fat), £13 to £20 10s; twice-crossed lambs, 16s to 33s; half-bred ewes, 38s to 46s; half-bred shearling gimmers, 35s to 39s; Scotch ewes, 12s to 15s; and shearling tups, from 60s to 155s per head." "THE GREAT OCTOBER SHEEP FAIR AT LEYBURN: Great anxiety has been felt in the Coverdale and Wensleydale districts since the termination of the Masham and Hawes fairs by the several dealers. It is well known that quantities of sheep were driven home unsold at both these fairs. ... A rough calculation gives the numbers this year to be full 13,000 sheep of all descriptions. The attendance of the Swaledale, Wensleydale, and Coverdale farmers was immense ... and a reduction of fully 2s per head for lambs, and other sheep in proportion, had to be taken on the prices of last week's markets ... A sale of tups took place in front of the Golden Lion, by Mr Imisson. Several were sold at prices from 50s to £4 10s." "MAD DOGS IN SWALEDALE:-The total number of dogs reported to have been suffering from madness in the ... neighbourhood of Thwaite is 33. Of this number four were destroyed and 14 died; thus leaving 15 still running at large." Reports of hydrophobic dogs had started in February. The 1871 Dogs Act enabled magistrates to impose heavy penalties for allowing dogs to roam at large, and a number of townships, from New Forest to Leyburn, were placed under restrictions. The newspapers of Leeds, Liverpool and Darlington reported deaths of many sheep, a calf, a pig, and a goose. "SWALEDALE AND WENSLEYDALE:- The land in these dales is principally in grass, and the farms are chiefly held by flockmasters. The hay crops, owing to the presence of bleak weather and the absence of rain, have been below the average ... Wages were unusually high, and hands difficult to engage." It seems that rain frequently came at the wrong time, or not at all, or too much. Reports in 1877 said hay was piled on walls to dry, or lay sodden in the meadows. However, the moisture promised an abundance of "after-grass" if the main crop could be lifted. I have seen "after-grass" described as "fog" - a late and desirable crop of young grass shoots. "RICHMOND MOOR FAIR:-This great annual cattle, horse, and sheep fair was commenced on Saturday, and will be continued over today ... There was a decided falling off in the quantity of cattle and sheep exhibited but there has seldom been a brisker trade doing ... 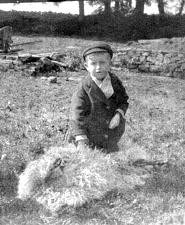 The leading Swaledale farmers, Messrs Richard Middleton, A Kilburn, Bainbridge and Metcalfe, had a tolerably good day of it, though they did not get quite so much money per head, nearly all descriptions of stock being down about 10s ... Ponies were numerous, and made all sorts of prices up to £35." "Superintendent Gregory has reported sheep scab to be prevalent on Keld Moor, Upper Swaledale, 100 sheep belonging to Mr Wm Kilburn of Hoggarth being affected ... Mr Fryer, vetinerary surgeon, [has been instructed] to inspect the sheep and all other sheep on the moor." At the Richmond Petty Sessions, Mr William Kilburn was later charged by Supt Gregory with neglecting to report the outbreak. The penalty of £470 [wow!] was not imposed this time "as he appeared to have been in ignorance" so they charged a fine of 1d per head and costs, amounting to £1 5s 1d. A similar case was taken against Wm Hutchinson, as mentioned in my 1880s migration essay. The same summer, swine fever hit the dale. "GUNNERSIDE FAIR, Saturday:- There was a large company present and an active business doing at this fair. Calving cows made up to £22, calving heifers £17 to £20, calves from six to ten months old up to £8, two-year-old bullocks £12 to £14, half-bred lambs 17s to 24s; Scotch lambs 10s to 16s; Scotch ewes 18s to 20s each." "RICHMOND, Saturday:-Butter 1s to 1s 2d per lb; eggs 12 and 13 for 1s; chickens 4s 6d to 4s 9d couple; ducks 4s 6d to 5s 6d per couple; leverets 1s 9d to 2s 6d each; pigeons 6s 6d to 8s per dozen; old bacon 8s 6d to 9s 6d; green [bacon] 6s to 7s 3d per stone; Swaledale and Wensleydale cheese 80s to 86s per cwt." "BROUGH HILL FAIR:-This three days' fair was concluded yesterday. The show of horses has been one of the largest on record ... Nine excursions were run by the Midland Railway Company from the principal centres of Yorkshire and Lancashire. Large droves of horses [this bit was a surprise] fresh from the fells of Stainmore, of Swaledale, and Wensleydale were shown ... bring from £14 to £25. Cattle were a poor lot, but sheep of fair quality." A similar report in 1892 described the horses more fully as "The small pony class is also a speciality, large droves of unbroken "stags" being driven in from the Swaledale and Stainmore Fells". This piece goes on to say that there was a good demand for "cavalry horses, tram and 'bus horses, etc." 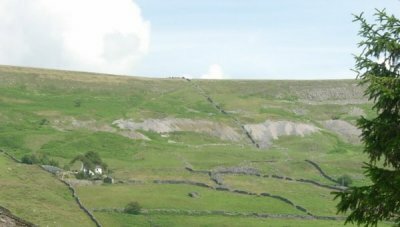 "SERIOUS LOSSES OF SHEEP IN THE DALES:-Of late the Swaledale, Wensleydale ... farmers ... have experience serious losses amongst their sheep flocks. The fact is attributed to the exceptionally open weather which has caused the grass land to sprout with remarkable rapidity, and the sheep have been killed with gross feeding. One farmer lost over fifty sheep in this way, and others have suffered very much." "A HAY FAMINE:-The recent snowstorm has been one of the most disastrous ever experienced in the dales west of Richmond ... The drifts are tremendous and some of the roads still blocked. For weeks there has not been any hay left ... Great difficulty is experienced in conveying the hay to Reeth [from Barnard Castle] where it is divided into lots and taken to the upper dales in sledges. Mr E A Knowles, of Low Row, will ... require 1,500 or 2,000 stones of hay yet. Mr Edward Stones who lives at the Hill Side Farm above Arkengarthdale has sent a portion of his stock down into the open country below Richmond. The price of hay has worked its way up from 4½d to 9d per stone. It costs some of the farmers over 1s per stone and means ruination to many." The same summer, swine fever hit the dale again. "We have taken a farm on Stainmore near Uncle George [George METCALFE at Skirry Gill]. There is about 110 acres of pasture and meadow land. We have taken about 300 sheep this fall belonging to the place. We shall perhaps milk 9 or 10 cows and bring up a good few young calves. It is a larger place than this." Unfortunately William had died by the 1891 census so there is no comparative record of how many hands they needed for this much larger farm. The two brothers now had farms of their own, and Ann had married my recently widowed great-grandfather in 1883. But at least this letter shows that you could expect to keep (and feed) 300 sheep and 10 cows, and at least four hardworking adults on 110 acres. I was also interested to note Ann's use of the word "fall" to mean "autumn" - is this another of those words which crossed the Atlantic but fell out of use here in England? In my Who did What? essay I write about the large number of Swaledalers who farmed land as well as working at another job. In the censuses they were described as "innkeeper and farmer", or "butcher and farmer" and so on; there was even one "dressmaker and farmer". To differentiate them from full-time farmers I called them smallholders, although a number of them held more than 20 acres. I did not include "landowner & farmer" in that graph, thinking that they belong to the full-time farmer group rather than the group of men digging their plots after a day down the mine. But "landowner & farmers" are included in the graph below (although "landowners" are not, since they tend to live in villages and I have assumed that they own the land rented and farmed by the smallholders). So following graph concentrates on full-time farmers and landowners with working farms, and shows how many farms there were in Upper Swaledale, and of what size. 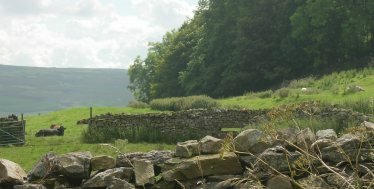 The 1881 censuses recorded a total of 308 farms in Upper Swaledale. Unfortunately the censuses for Reeth, Healaugh and Grinton did not record the acreage of farms so 126 of those farms are of unknown size. This is more than a third of the total number of farms in the dale (182 did give their size), so those 126 have to be distributed somehow. I decided to distribute them in the same ratio as the known sizes. Increasing the known total for each farm size by 70% resulted in an accurate total number of farms - 308 - for 1881, and this is what the graph shows. Having distributed the unknown-size farms for 1881, I did the same for the other years, in the same way, as follows: 12 in 1851, 28 in 1861, 31 in 1871. This is not really satisfactory, but it makes the best sense of the available data. Of the farms detailed in censuses for 1851, 1861, 1871 and 1881, the most common size of farm for a full-time farmer was between 20 and 50 acres. For the most part, these 20-50 acre farms were worked by the farmer and his wife. Any grown-up children still at home were usually employed elsewhere – as carriers, or other tradesmen. Coal- or lead-mining sons were common, so they would be able to help out if needed seasonally. Very rarely did such farms have live-in farm labourers. Farms and farm buildings on Harkerside, seen from Reeth. So the number of farm labourers living off site was really very small. They must have depended on getting casual work at busy times of year, or on working part-time on a number of farms. A bit like Eddie Grundy (if you are an Archers fan). Of those farm labourers who were also Heads of household, I suspect a significant number were in tied cottages since they occur mainly in Marrick and Ellerton Abbey, or near large farms and estates. It is also interesting to see how the number of farms went up even though the number of labourers dithered and then went down, suggesting a much greater number of self-sufficient small farms at the end of the century. In 1851, in addition to specifying their farm acreages, 24 farmers in Angram and Thwaite claimed common rights, and a further 7 in Hurst claimed access to significant (250acres+) areas of moorland. This was not mentioned in later censuses and I do not know how complete or permanent it was. There are 640 acres in a square mile. But what does that look like in real fields? This aerial photograph covers an area of about 2 miles x 3 miles, somewhere in England. 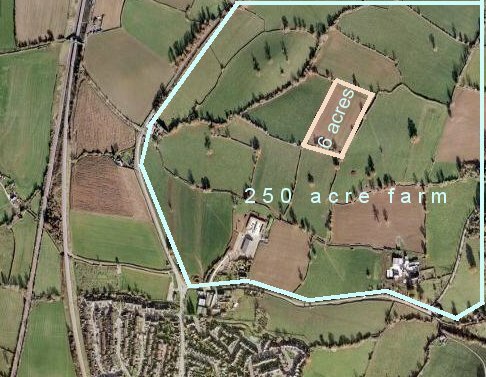 The outlined farm area is about 250 acres (about 100 hectares), and the brown rectangular field in the centre is about 6 acres (2.5 hectares). The built-up block of streets at the bottom of the photograph covers about 20 acres, and Christopher Robin's famous 100-acre wood would occupy the area between the farm's western boundary and the road, which looks plenty big enough for a piglet, a bear and a small boy. According to an English smallholder living in France, you can keep 2 sheep per acre in the Scottish highlands and 4 sheep per acre on Welsh hills. Ann Buxton’s letter said they were planning to keep 10 cows and 300 sheep on 110 acres. So it is reasonable to assume that the most common size of Swaledale farm - 50 acres - would support 130 sheep and 3 cows. I have no way of confirming that this was true, or desirable, and plan to go no further with this speculation.